I just had to share with you a recipe I developed for my latest article in Cravings Magazine. Before I stopped buying ice cream and started making my own at home my absolute favourite ice cream was Maggie Beer‘s Burnt Fig, Honeycomb and Caramel Ice Cream. I couldn’t get enough of the stuff, despite the hefty price tag. I’d buy a tub, and scoop spoonfuls into a coffee mug, my favourite way to eat ice cream, and savour the amazing flavour. Luckily this was another one of those foods that my fiance didn’t like, but to be honest I was secretly quite happy he didn’t like it as it meant more for me. So my fiance would have vanilla ice cream with sprinkles (yes, he’s a big kid) and I’d enjoy my honey roasted fig ice cream. All that changed once I bought an ice cream maker. My fiance was sceptical that the ice cream would actually get used, but true to my word since I bought it we haven’t purchased a single tub of ice cream and I love experimenting with flavours and making my own ice creams and sorbets. There’s been everything from spice roasted pineapple ice cream, roasted strawberry ice cream, kiwi fruit sorbet (my youngest stepsons favourite), blood orange sorbet, strawberry sorbet, and grape and pink champagne sorbet, along with frequent batches of vanilla ice cream. So when it was fig season I couldn’t wait to try my hand at making my own version of Maggie Beer’s infamous burnt fig ice cream. Not having a recipe to go with I decided to roast the figs coated in honey to bring out their sweetness and to also help caramelise them. They smelled amazing while roasting and tasted even better when I tried one after they came out of the oven. In fact, they would be amazing as is served with a couple of scoops of vanilla ice cream, but I decided to continue on my quest of making fig ice cream. Once the figs were cooled I blitzed them in a food processor and then loosened the mixture with a little vodka. I always use a little vodka in homemade ice creams to help ensure that they are soft and scoopable direct from the freezer. You could of course use a flavoured liqeuer, but I like using vodka because it doesn’t interfere with the flavours I’m working on. Of course, you can skip the vodka if you like, especially to make it child friendly, but note that you may need to let the ice cream sit for a few minutes out of the freezer before scooping. Once the fig mixture was ready I began making the ice cream base. For this I went with an egg custard ice cream, which I just adore as it’s so silky smooth. The custard was infused with fresh vanilla and then once it had cooled overnight added to the ice cream maker to churn. When the ice cream is almost done add the fig mixture and allow it to mix through and freeze for a couple of hours before serving. 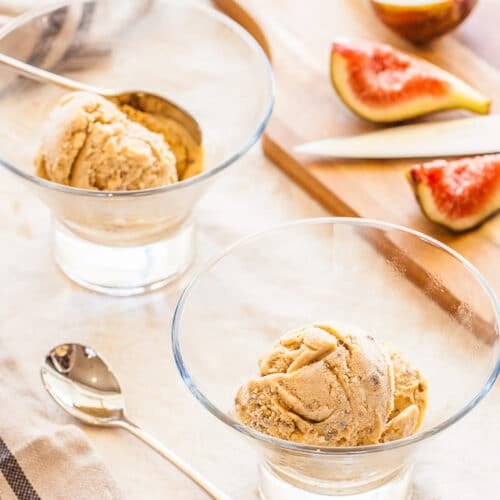 When my parents were visiting recently we enjoyed some of my honey roasted fig ice cream and before I had a chance to tell my Mum that this was my version of Maggie Beer’s Ice Cream she said “This is just like Maggie Beer’s ice cream, only better”. As to the last part of her comment, I’m not sure if that is just motherly support, but I was pretty pleased with how the flavours turned out. So tell me, what is your favourite commercial ice cream flavour and have you tried or perhaps successfully reproduced it at home? 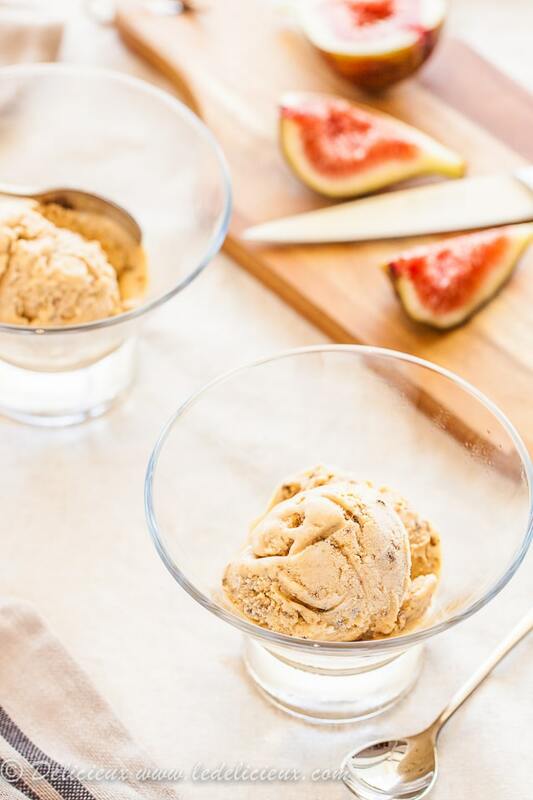 So when it was fig season I couldn’t wait to try my hand at making my Honey Roasted Fig Ice Cream - my own version of Maggie Beer’s infamous burnt fig ice cream. Place the milk, cream, vanilla bean and seeds in a large saucepan and bring to the boil. While the mixture is heating combine the egg yolks and sugar in the bowl of an electric mixer fitter with a whisk attachment. Whisk until the mixture is lightly thickened and then gradually add the milk mixture into the egg yolks. Do this slowly so as not to curdle the eggs. Pour the mixture back into the saucepan and return to a medium low heat and stir and check the consistency by turning the spoon over and running your finger through the mixture that has coated the spoon. If the line from your finger remains clear then the custard is ready. Pour the custard into a large bowl and cover with cling film and refrigerate overnight. Preheat the oven to 200 celsius (400 Fahrenheit) and line a roasting pan with baking paper. Combine the figs, honey and brown sugar in a bowl and then spread the mixture evenly over the roasting pan. Bake for 15 to 20 minutes or until caramelised and set aside to cool. Once the figs have cooled place into a food processor and process. Loosen the mixture with the vodka. Prepare the ice cream maker. Strain the custard through a fine mesh sieve and discard the vanilla bean pod and pour into the ice cream maker and chill according to your manufacturers instructions. When the ice cream is almost done add the pureed figs and allow it to mix through. When finished pack into a large freezer safe container and cover and freeze for 4 hours before serving. be better with these green figs. Any thoughts?? Advice? Thank you. I’ve only ever come across mission figs here. Lucky you for having a fig tree though! I did some quick googling and came across a number of roasted fig recipes that use green figs, so I think you’d be fine. I’d suggest perhaps try roasted a couple first and see how they are before committing to a larger batch for the ice cream. I’d love to hear how you go! Vodka sounds like a great trick for making sure homemade ice cream isn’t rock solid. Gary Mehighan on one of the master classes also suggested adding glucose syrup to achieve the same effect. I’ve never tried either but am willing to give both a go! It seems I missed a step about pureeing the figs and adding the vodka. I’ve updated the recipe. As for pureeing the figs, I pureed mine relatively finely. It’s up to you how roughly you chop them. Peanut brittle icecream which my son recently introduced to me. Made by Sara Lee and as with your burnt fig iceream it is rather morrish and a tad expensive. None the less, it is savoured with each delicious mouthful – pure indulgance and bliss. 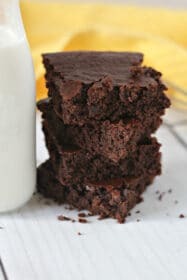 I’d love to hear if other viewers have a recipie that is close in order to replicate or make at home? Who can resist caramel ice cream?It is one of my favorite! Lol, I’m glad your fiance don’t like it, at least you don’t have to share it to them. My favorite is a seasonal ice cream called UBE Ice Cream, it’s a beautiful violet color and it is so good! I’ve been thinking about getting an icecream maker, but we keep telling ourselves we don’t have enough room. But reading your recipes makes me want it even more! Fantastic recipe that incorporates great flavors..I need more figs in my life right now. Love that one of Maggie’s, Jen, so this is a great recipe for me. Lovely compliment from your mum! Personally, I think all grown men are like big kids :O I love this recipe! I wants to try this now too! That sounds like a killer combination! When I first go my ice cream maker I went a little crazy and couldn’t stop making ice cream either! That’s so weird, I was just pulling my ice cream maker out today after storing it for about a year. Sadly it corroded around the lip of the canister 🙁 I suppose I’ll have to get another, I can’t go all summer without real ice cream!! Whoa! Fig ice cream?? What a fun treat! I can just smell the figs roasting in the oven! Gorgeous ice cream Jennifer! Sounds divine! I love her fig ice cream as well. 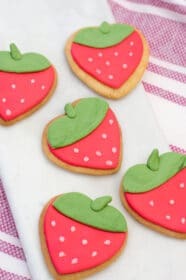 Strawberry was always my fav growing up – but only one brand that used real berries – none of the funky ‘strawberry flavoured’ stuff! Looks delicious..I cant wait to try this and share to my friend..Thank you for sharing some recipe with us.. This ice cream looks really yummy..Thanks for sharing the recipe..I appreciate it and I will try this..Thanks for sharing with us.. I loved this icecream…so full of flavours! The picture is so tempting!! Please drop by my blog http://cosmopolitancurrymania.blogspot.com/ to collect some awards for you! Thank you for the awards 😀 You are so sweet. 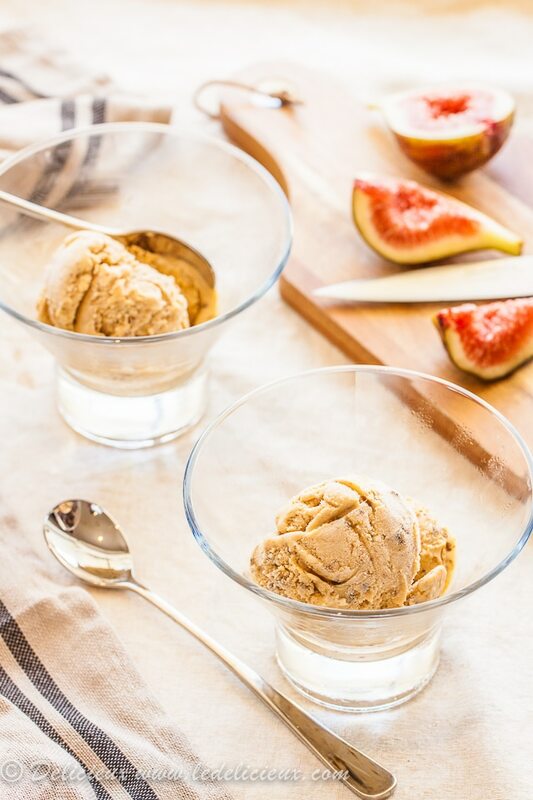 Never thought of making ice cream with fresh figs..this is absolutely wonderful! Beautiful color and awesome clicks. Mmmmm… creamy dreamy fig ice cream! I’m so inspired by this to get my machine out from the back corner of the cabinet! I’ve had my eye on a David Lebovitz pear and caramel ice cream for a while, but it might have to get shelved in favour of this! Love the idea of those sweet sticky figs and the rich egg custard. This looks divine. I have been contemplating purchasing an ice cream maker. Are you able to recommend any (yours sounds pretty good!)? I have a Cuisinart Ice Cream maker and it works really well for me. The only negative I would have to say is the noise, as it’s quite noisy when it’s churning, but other than that it does the job really well. 😀 I hope that helps. I didn’t know that trick about the vodka that’s great. Whenever I make ice-cream at home it’s like a rock. This flavour sounds amazing. I hate to say I’m a bit boring with my flavours. Mint chip would be my favourite and then hazelnut. Yum! A wonderful ice cream! I dislike dried figs, but love the fresh kind, so this is perfect. I adore figs… both fresh and dried. Even though I don’t enjoy ice cream as much, these might just makes it’s way to me heart. GORGEOUS light on the photos as always 🙂 Love it! Oooh man! I am in such love with figs, I would die for a scoop of this! This sounds so delicious Jennifer, love figs in all of their incarnations – adding to the must try list! I like Serendipity’s Honey Almond Nougat, but my favourite home made ice creams and coconut or coffee choc chip. Sooo moreish! Hi, Amanda from Lamb Ears and Honey recommended your blog to me. Lovely images. I have wanted an ice cream maker for the longest time. It absolutely has to be my next purchase. I buy that Maggie Beer ice cream too. It’s very good isn’t it. Great you can now make your own and for a fraction of the cost! Sending you the sweetest wishes for your grandparents, XO! Simply scrumptious! I love figs and this is at the top of my “make list”. Roasting the figs in honey is a fabulous idea. Your ice cream looks delectable! fantastic! I love Maggie’s fig ice-cream, and cannot wait to try this.